Places Center is a feature-rich, cross-platform Cinnamon applet that provides easy access to all of your most-used places. Great applet! In previous version FTP site opened in Nemo. Now in the browser. Can it be changed to Nemo again? Great app. A feature request; would it be possible to add a column where a list of files inside a user-specified directory (or directories) are displayed? E.g., a column for user, a column for system, a column for some files. I'm basically just looking for a way to quickly access apps, that are located in a custom applications folder, from a drop down menu. I find the main Cinnamon menu to be fairly limited, and It would seem to fit this app well. Thanks for maintaining this! Great applet but it doesn't work anymore - neither in 18.3 nor in 19.1. This was something I missed about gnome. Was happy to have found it. Thanks. Hi Stephen, I was a very satisfied user of Places Center until my favorite places became too many. So I modified applet.js to create a userScrollBox like you did for your recentScrollBox. And I am again a very satisfied user! Should I do a PR on your Cinnamon-Place-Center repo (it does not seem up to date) or on linuxmint / cinnamon-spices-applets? I also made a fr.po file, using poedit. hi claudiux, please submit pull requests to the cinnamon-spices-applets repository. I don't maintain my personal repositories anymore. I just haven't got around to deleting them yet. Not showing on the panel, it's on the panel but no icon and such, just see a blip on the panel when adding mint 17.3, Cinnamon 2.8.6 and 2.8.8, please fix, thanks. Hi, saying it's broken is not helpful at all. I need more information before I can identify the problem and fix it. Please open a bug report on github as this is not really designed for this. It will prompt you for the majority of the information I will require, and facilitate a much more reliable and speedy communication for additional information and testing. Thanks. Nice! It does however seem to significantly slow a system reboot. Cinnamon ver 3.2.7 on Debian Stretch 9.2 on x86-64. I have been using it successfully for several years. A very good and necessary applet. Thank you! But after updating to current version (on the date of writing the post) I observe situation: - there are several mounted disks; if click on the "triangle" icon in applet to unmount one of them - all mounted disks become unmounted. Inspect on two machines (with Cinnamon 3.4.6) - similar situation. I'm not sure what could be causing the issue. It works fine for me on the latest Cinnamon. I haven't made any significant changes in a while. Certainly nothing that would be related to unmounting drives. 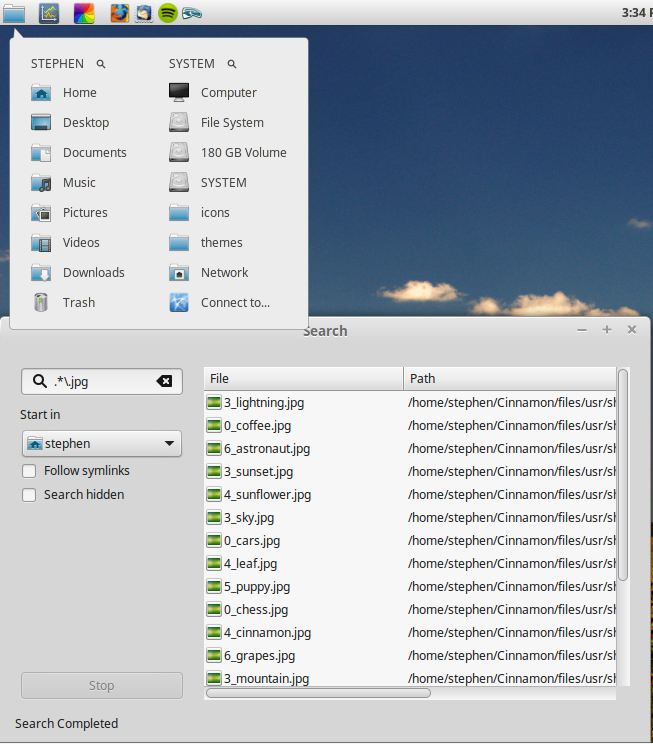 Do you see it in Nemo and/or the removable drives applet (included with Cinnamon), or is it only happening with my applet? Please disregard my previous msg. Everything's fine. I deleted some directories from Home but they're still showing in Places Center. Is there a cached file I could delete? Or how could I refresh? BTW, I use a vertical panel layout and Places Center works perfectly. It works in vertical panel for me. Did you make sure it was completely up to date first? It was only added recently. Great addon, but unfortunately doesn't work in vertical panel layout.